The scheduling of the League Cup has long been a debatable issue since the inception of this tournament some five years old that either saw it took place during the pre-season or middle of the league fixtures. Being widely perceived as the "poor cousin" of the more prestigious two - the league championship and the Singapore Cup, it's not wonder regional football blogger, Antony Sutton of "Jakarta Casual" have this to say. "Just because they have a League Cup in England doesn't mean every other country needs to copy it... This is an unnecessary addition to an overcrowded fixture list." commented Antony in his recent entry upon received the media release of the Cup draw held on Friday. What the Jakarta-based blogger said is not without his concern. Bear it in mind that weeks ago, the league had undergone a massive fixture scheduling that as many 40 matches (as I was told) were being postponed as the result due to various complications. Etoile FC was the last season winners of the League Cup. However, Albirex Niigata (Singapore) club manager Koh Mui Tee felt the scheduling of the League Cup tournament should not big a major concern. “The rescheduling of the fixtures does not impact the league cup fixtures as the period for the League Cup has already been fixed when we received the whole season schedule in February this year.” opined Koh. Nonetheless, not all share the same opinion from Koh's perspective with one club official speaks in condition of anonymity felt otherwise. “While I understand the timing of the League Cup (is) due to (the) World Cup Qualifiers. They could have scheduled the draw before the release of rescheduling of (the league) fixtures last month. “Now is like planning and re-planning with two weeks to start of competition. Some teams will be affected by no national players (in their teams). If a sponsor wants to come, they will think thrice.” said this club official highlighted his concern over the lack of preparation time for teams and difficulties might be facing the organizers in attracting a title sponsor for this tournament. 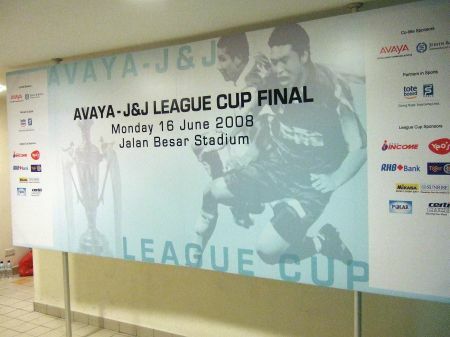 The last title sponsor for the tournament was "Avaya - J&J"
Also taking into account that rescheduling of matches have various implications such as fatigue issues that might have impact on some teams' momentum which Koh thought otherwise. “Impact on players for burnt out is non-issue. Leagues in Europe and Japan has two Cup tournaments, same in Singapore. So I don't see why there is any reason for burn out.” said Koh. Personally speaking, I would rather have this “poor cousin” be played at the pre-season period which I blogged my suggestion last year after Etoile claimed their first honours by beating Woodlands Wellington. Anyone still keen on my suggestion?